One day, Deirdrelocks was walking along and she smelled the nasty smell of oatmeal coming from the woods. “Yuck,” she said, and started to walk away. Then she said, “Oh yeah, I’m supposed to go in and eat up all the bears oatmeal. I hope it doesn’t kill me!” So she walked into the woods, and saw three bowls of Oatmeal sitting near a fire. She dumped all the biggest bowls oatmeal into her mouth. “Yuck,” she said. “That was terrible!” She ate up the next bowl of oatmeal. “Even worse!” she yelled. She ate up the smallest bowl of oatmeal, and she fell over dead it was so yucky. Then the three dads came along. “Yay!” they yelled. “Now we don’t have to eat our oatmeal anymore!” And they ate up yummy Dierdrelocks instead and lived happily ever after! THE END! There. I taught you that oatmeal tastes bad (like you didn’t already know) and that my dad likes to bite deirdre. The moral to this story is NEVER READ STUPID STORIES LIKE THIS. Bye. 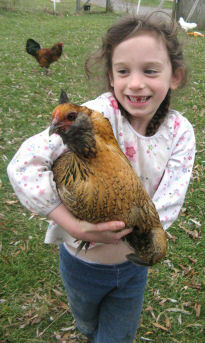 Waah, I can’t play with the chickens, it’s wintertime–it’s too cold out! There’s one chicken that’s so dumb that she always be’s nice to me. And I call her Blackbeard. That same chicken used to peck out my eyeballs! (Not really peck out my eyeballs, she just always tried to. But now she doesn’t do that.) And whenever I want Blackbeard to jump on my back, I just bend down, and she just “hups” right on my back! But I shouldn’t really do that because my brother Evan who feeds the chickens, then she always jumps on his back and he doesn’t like that. Instead of sledding . . .
. . . Justin and Owen made snow boulders! Owen is usually the first of the little kids to go outside. He is what I call the “Great-Day Heralder”, because he’s always on the lookout for Great Days and proclaims them with much enthusiasm. On such a day, he’ll say as he washes breakfast dishes, “Boy it looks like a great day out there, I’m gonna try to finish these dishes extra fast so I can go out there.” After he finishes dishes he usually goes out for a little bit to see how it is out there. He comes back in exclaiming, “GREAT day out there! It’s a great day out there! Man, it’s such a GREAT day out there, Hammie [Caleb] want to come out with me after I’m done with my homeschooling?” Caleb usually makes a non-committal noise like “Mmmm…” Owen usually has to badger him about it to get him to come out, but once he does they both have a great time out there. On this particular day–New Year’s day–Justin was the one who came out with Owen, though Caleb came out a little later. Owen was going out to try out the snow. As he was getting ready to walk out, Justin said to him, “Tell me if it’s good for making a snowman.” Owen came back in a little later, saying, “Justin it’s GREAT for making a snowman, if you want to come out.” Justin stayed at the computer without making any response, and Owen was a little impatient. He came into the dining room and said, “Well Justin, ARE you going to come out? Oh yeah I forgot, just because I said you could doesn’t mean you’re going to.” Of course, Justin was the one who said to tell him if the snow was good for making snowmen, and he did come out. 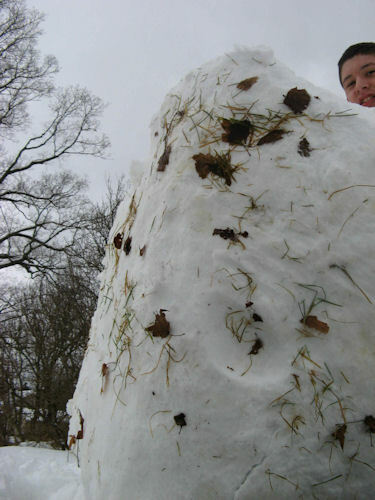 When I looked out the door window a while later, Justin and Owen were together rolling up a huge snowball on the front lawn. Justin has done this before–he’s not much of a one to moderate. 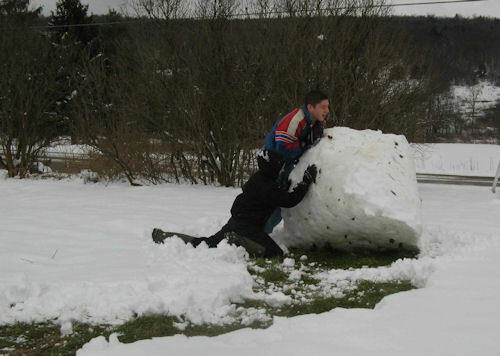 If the snow’s good for rolling up snow, he’s not just going to roll up some medium-sized ball. He’s going to roll up a HUGE ball because–why stop rolling? The snow was wet enough that it rolled right up like a blanket, as you can see. The chickens always get out! It was digging in Mom’s garden so I thought it was gonna lay some EGGS there. So I thought it was a she but then I said he after that so then it WAS a he…so…I just got jumbled up. As soon as Cadie told me that when she was outside she said “Wait it IS a he so why did you think it was laying eggs?” The chicken was on the stump that Temmy’s truck backs into, and went over near to the fence. 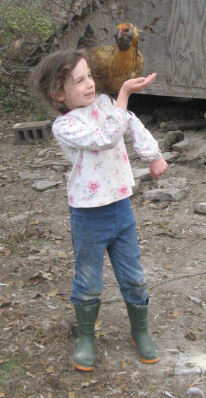 Then as soon as Cadie got on her shoes and sweaters she went outside and chased it into the fence. Actually she didn’t really chase it in, it flew into the fence its own way. Then I shut the fence and Cadie locked it. The end, heh heh. Why’s I said ‘heh heh’ is because usually at the end of a story they don’t say “the end”, so, “heh heh”! At least most books I read.